This was another wild weekend. We went to Norman on Friday to watch Timothy play baseball. He didn’t win but the great part for us was that we got to watch him play. Of course we went to see Bob. He is really doing well and if all continues on he will go home this Friday. I am so excited that we are getting close to him getting out of the hospital. Chandra flew down for her high school class reunion. She spent time with Piper then went to OKC to see Bob and watch Timothy. She then went up to her reunion where she spent time with family and some of her classmates. She’s back home now. Joshua and Danielle were out of town because her grandmother near Blanco passed away. They left on Thursday afternoon and the service was on Friday. Joshua sent a text that they had made it to Fredericksburg and were going to stop. They had to stop and he was going to buy some dress clothes because he had left his hanging in the hall at home. Of course I had to text back and say I had seen his clothes hanging in the hall. I did add a smiley face just for fun! He wasn’t real happy about forgetting his clothes or that I was making fun of the situation. But it made me stop and think. The Apostle Paul tells us in Ephesians 6 that we need to be dressed for the battle that is before us. He says in 6:11 that we need to “Put on the FULL armor of God that you may be able to stand firm against the schemes of the devil.” I emphasize ‘FULL’ because Paul did not say come with partial armor; he wanted the church in Ephesus, to be clad in the FULL armor. He went on to tell them exactly what armor they needed. He said they needed to ‘gird their loins with truth, put on the breastplate of righteousness, shod their feet with the preparation of the gospel of peace, take up the shield of faith, take up the helmet of salvation, and the sword of the Spirit.’ The Christian who dresses in this fashion will be ready to do battle as they enter the arena of life. If Joshua had gone back and walked through the house one more time, he may have seen his clothes hanging on the door. But he didn’t. I know he is not the first nor will he be the last to forget some clothes or some other personal item. I guess what Paul said in v.18 needs to be heard, He said, “With all prayer and petition, pray at all times in the Spirit, and with this in view, be on the alert with all perseverance and petition for all the saints.” Very simply put – put on each piece with prayer. Through prayer we will be prepared to stand against satan as he comes against us. If we leave off a piece of our armor we can’t go somewhere and pick it up. Either we have it or we don’t. Either we are dressed to do battle or we aren’t. I fear that many of us step out of the house each day with little thought about how we are dressed spiritually. In fact, often we may have left the ‘breastplate of righteousness’ behind and even replaced it with ‘self-righteousness’ instead. There is no substitute for the life God desires us to live. 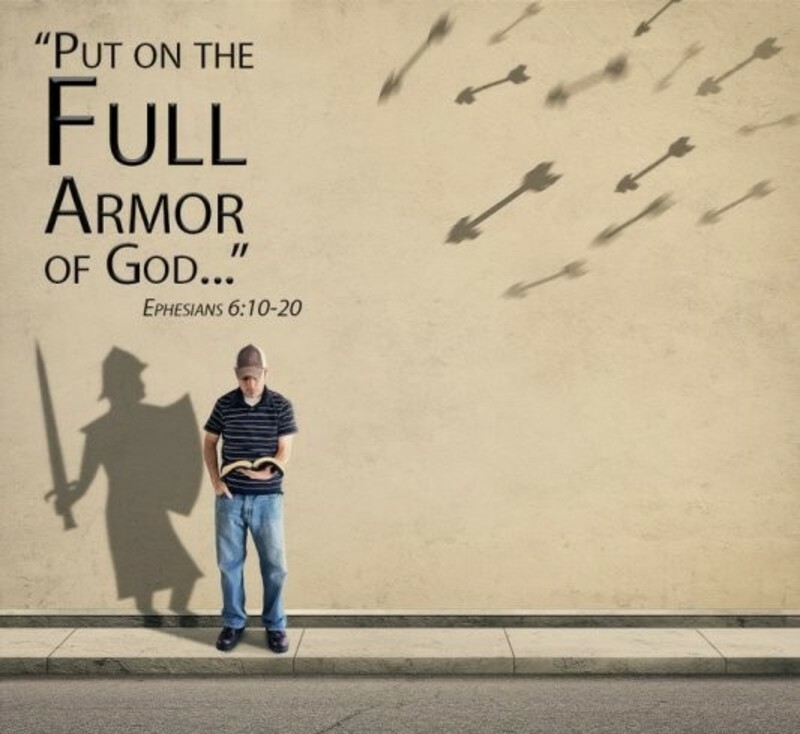 So we need to – “Put on the full armor of God that you may be able to stand firm against the schemes of the devil.” We do this because -- “Our struggle is not against flesh and blood, but against the rulers, against the powers, against the world forces of this darkness, against the spiritual forces of wickedness in the heavenly places.” (Eph. 6:12). So the next time you pack for a trip make sure you have everything packed. But most of all make sure you have on the full armor of God. After all any trip you have planned in this life is short compared to eternity.